The inaugural Mickey Thompson AORRA Qld Off Road Racing Championship will celebrate its newly minted champions on Saturday 17th November at the North Lakes Hotel & Conference Centre. 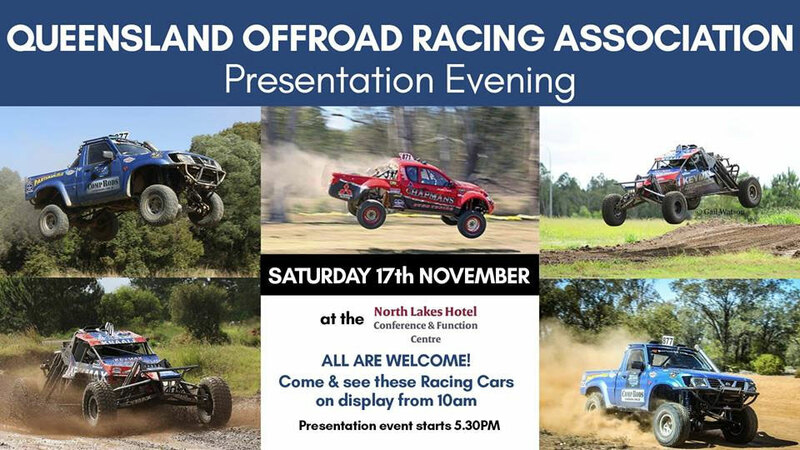 Podium placegetters for both outright and class for the Mickey Thompson AORRA Qld Off Road Racing Championship and the Mickey Thompson AORRA Qld Off Road Racing Short Course Series will be recognised at the presentation evening. The use of the North Lakes Hotel & Conference Centre has been generously donated, courtesy of Jan Kraaj from Keymax Pty Ltd. The function will be held on the first floor, and to add to the off road theme, there may even be some arrows to show you the way. The green flag drops at 5.30 pm. Everyone is welcome to attend and with no admission fee, and meals and drinks are available for purchase on the night, it’s sure to be a great night out with the off road family. To promote off road racing, there will be a display of off road machinery at the hotel from 10am until the end of the event, so if you're interested in off road racing come along and have a look at these great cars, and if you're lucky get to see them started up - all members of the public are welcome! There have also been some great donations for door prizes, which will be drawn on the night. It should be a great finale to what has been a great year of racing! If you’re planning on attending, please advise Leila Chapman how many people will be in your group. This will greatly assist in catering and set up of the venue. Congratulations to not only the place getters but to everyone that supported the events and made Queensland off road racing a huge success in 2018.